Last year GrowCity reported on the urban agriculture talks at the ASLA conference, taking the pulse of the professional conversation around implementing and conceptualizing edible landscapes This year I wasn't able to attend but am happy to feature a guest post by Jessamyn Lett, a landscape designer at Middlebrook Gardens, and a recent graduate of the U C Davis landscape architecture program. Her senior project focused on 'The Role of Desingers in Urban Agriculture' and you can check it out through this link - http://lda.ucdavis.edu/people/2012/JLett.pdf. Food has always been an interest of mine and at the ALSA conference in Phoenix I went to two of the education sessions that focused on food production; ‘Opportunities to Design and Build Eco-Learning Labs on School Campuses’ and ‘Beyond Food Production: Agriculture and Landscape Architecture in the 21st Century’. 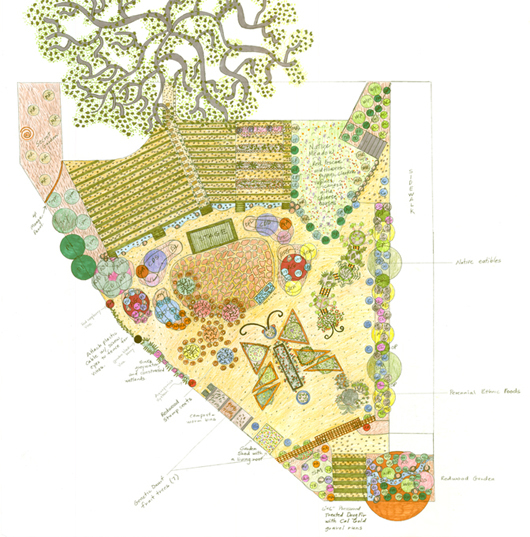 ‘Opportunities to Design and Build Eco-Learning Labs on School Campuses’ was a presentation by Alrie Middlebrook (my boss), head of Middlebrook Gardens, and president and founder of the California Native Garden Foundation (CNGF). 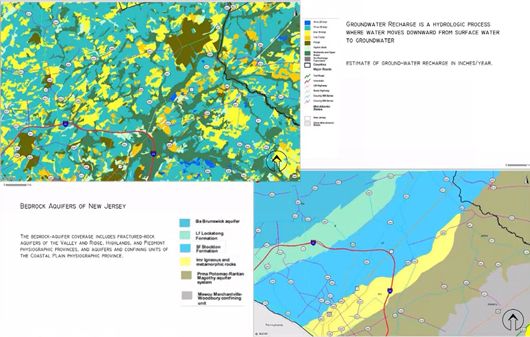 During this presentation Middlebrook presented a model for school campuses called the Environmental Laboratory for Sustainability and Ecological Education (ELSEE). 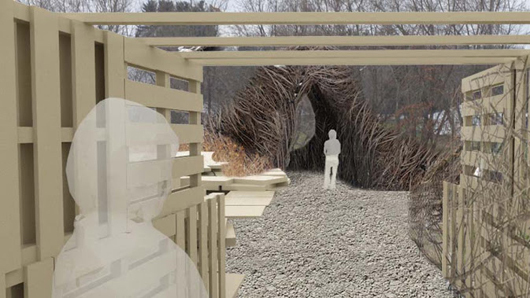 This model promotes landscaping that is 66% native plants and 33% edibles. 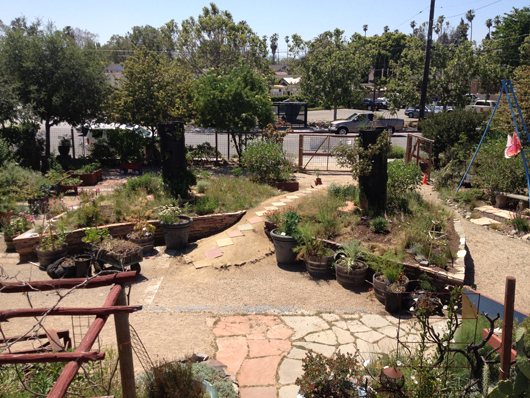 The ELSEE model incorporates active, outdoor learning and provides lesson plans and activities that educate children about ecosystem services, interconnectedness, and stewardship, while meeting the California Science Standards.I found it interesting that although a large part of this model promotes edible plants, native plants, and native edibles, the title does not mention the words edible, food, or agriculture. This seems to be a path that urban agriculture is taking - where it is not a separate thing, but rather integrated into landscape architecture and urban landscapes. Middlebrook first spoke of the importance of designers as educators. She emphasized that it is not enough to design, but we must understand the lessons our design is conveying. The presentation was formatted to talk about specific design elements within the ELSEE model, and the lessons they taught, both to the children who learn from them, and to the parents, teachers, administrators, and anyone using an ELSEE site. The overarching lessons were the importance of ecosystem services, the interconnectedness of everything, and the need for stewardship of our earth. One of the design elements she highlighted was a sink greywater system. This living machine utilizes microbes in the soil to clean the water, replicating a riparian ecosystem. She used this system to produce seven different California native food plants, including four kinds of berries. This system teaches watershed stewardship and management, water conversation, how to grow riparian food plants, and how a biological water purification system works. 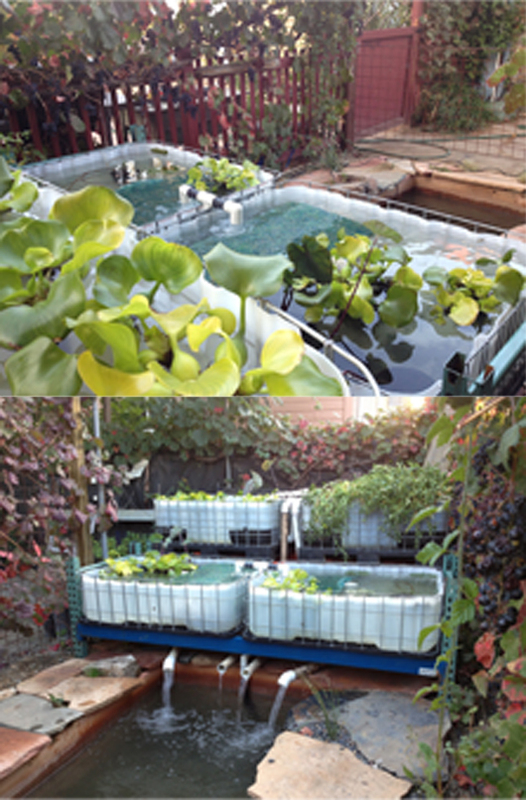 Another ELSEE technology is an aquaponics system. This system will produce a variety of wetland edibles. Because the system is still being ‘seasoned’ and developing microorganisms the only food plant it currently produces is watercress, but it will eventually provide a variety of edible greens and edible fish: the Sacramento Perch. This system grows high volumes of food on very little space and the only input required after establishment is fish food, although Middlebrook hopes to grow everything the fish need to eat. This element teaches about the link between terrestrial ecosystems and marine ecosystems, it illustrates aquatic food production, and teaches the water cycle. Middlebrook’s philosophy of interconnectedness between food production, sustainability, and education showed that the strength of urban agriculture is not just its ability to provide nutritious food, or reduce food miles, or promote healthy life styles. Middlebrook presented urban agriculture as a multifunctional, integrated, technology that can provide ecosystem services, teach eco-literacy, and promote stewardship of the earth. The next session was titled ‘Beyond Food Production: Agriculture and Landscape Architecture in the 21st Century’. This presentation had four different speakers. Edward Krafcik, designer at Keith LeBlanc LandscapeArchitecture, spoke about urban agriculture at a residential scale. Richard Shaw, Principal at Design Workshop, Inc, walked us through the local food production district in Adam’s County, Colorado. Dan Wood, principal at WorkArchitecture, explained Work’s concept of Infoodstructure and some of their new technologies. One presenter, Holly Grace Nelson, an instructor at Rutgers, The State University of NJ, spoke about an Agricultural Literacy studio she taught, and her presentation had ideas parallel much of what Middlebrook had discussed. Again the title of her presentation ‘Agricultural Literacy and Agriculture in the Landscape Architecture Studio’ included the idea of literacy, much like Middlebrook’s idea of eco-literacy. Although here agriculture is more prominently featured in the title, there is an incorporation of agriculture into landscape architecture and a sense that agriculture has many purposes and many uses, including the ability to teach. The multi-functional aspect of urban agriculture presented resonates with me. In my senior project I discuss the strength of urban agriculture is its ability to fulfill so many needs. I even define successful urban agriculture sites as ones that are able to meet the most needs. Nelson’s studio seemed an appropriate follow up to Middlebrook’s presentation because the ELSEE model focuses on Kindergarten through 12th grade, and Nelson’s talk goes on to focus on college students. 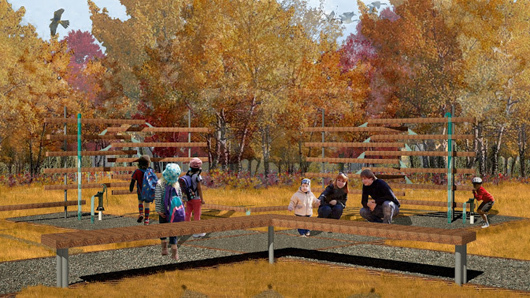 This studio was able to educate the next level of students about urban agriculture, and the students also looked at how they could educate the public about food production using landscape architecture. 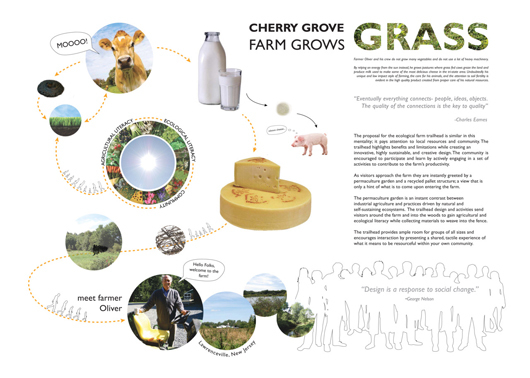 To do this the studio analyzed Cherry Grove Farm, a small cheese farm in NJ. 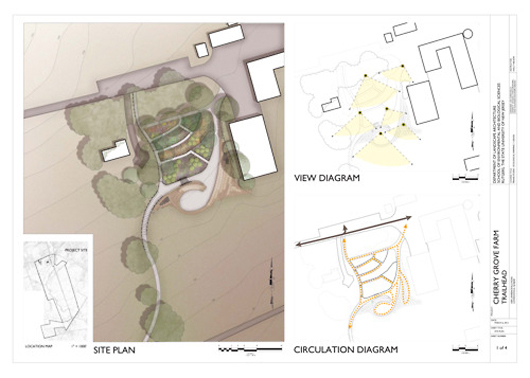 They then created a design for a trailhead at Cherry Grove Farm, and got to build a portion of their design. At the analysis stage the students looked at the site and its effects within a larger context. They observed the greater watershed, the other farms in the region, and the historical context of the farm. When I returned from the conference I wanted to know more about this project and I did some research and found a great video a student in the studio made about the studio, embedded below. In this video a student explains that during their initial visit “what we saw looked natural as if it had been there without human intervention”. One concept the studio learned about is ‘biodynamics’, which they define as “a holistic approach to organic agriculture that attempts to integrate the interrelated ecologies of soil, animal, plants and the atmosphere and employ them in self sustaining systems.” Nelson went on to show much of their design work, and the construction they completed on the trial head. 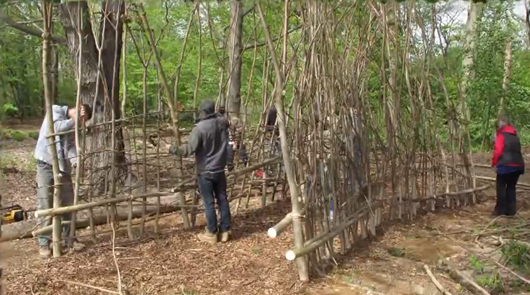 The students created a gateway of trunks, branches and vines of invasive plants found on the site. This built piece is an excellent example how the studio achieved their design goal of agricultural literacy. The gateway teaches about invasive plants and the native ecosystem, about construction techniques, and as one student put it “the benefits of collective effort, the strength of community and maybe that is one of the major lessons that agriculture literacy has to offer." The other speakers in this session had some interesting ideas and showed some interesting techniques, but Nelson and Middlebrook seemed to me to present a message that urban agriculture can be an integrated part of design, can educate, and provides for many needs.